On my way to LA. So I thought I’d say “see you soon” to some of my favorite Boston and Cambridge spots. 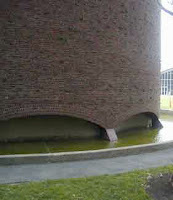 Here’s the Saarinen chapel at MIT. Don’t the electric lights above the altar look like a blue LA sky? The ‘piccolo Pantheon’ of Cambridge. If you visit Boston this week for the AIA convention and you find you need “a place of mystic quiet,” here you are. See it if you visit Boston next month for the AIA convention. A new LeWitt in Boston. 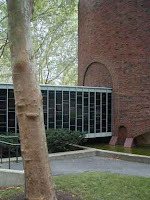 I was asked to describe the journey into Eero Saarinen’s chapel at MIT. One thing that amazes me about it is how in such a small volume it moves so much air and space. 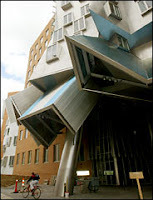 Which got me thinking about something else associated with MIT that moves a lot of air inside a small volume…. Only because the two tunnels fold back and forth can enough air be moved in the right way to create a rich, full sound. This is hard to achieve in such a small enclosure. Inventor Amar Bose is a famous MIT alum. To enter the Pantheon, you pass through a portico. The little tunnel is an important part of the journey. The contemplative space inside could not be directly connected to the rest of the world; there must be a passage to it, and in modernist spirit Saarinen also has us make a 90 degree turn just after entering the portico/tunnel. This helps to leave daily life behind. Some people say it also means the bad spirits can’t follow you. But back to the Modern. And its connections to the past. In Saarinen’s chapel the steps and base of the altar are Roman travertine. The altar is marble. Too bad the eye at the top of this is not open to the sky, but that wasn’t exactly the thinking in 1955 when this went up. 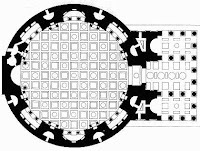 The shapes connect as in classical buildings which often put patterns on the floors that reprise the ceiling and thus create a cosmos. I wonder when we’ll see chapels, like sports stadia, with retractable domes? And only a Modernist would make a dome with a flat roof. But here, the eye creates the dome, and the sculpture atop the building creates a top point for you. 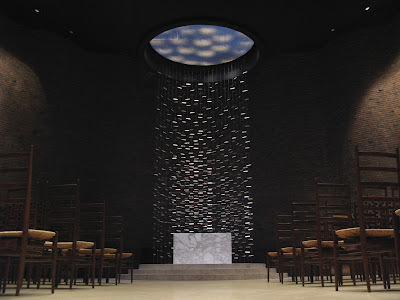 Did you know that Aaron Copland’s “Canticle of Freedom” was commissioned by MIT for the opening of the chapel and Eero Saarinen’s nearby Kresge Auditorium? So back to music. The Pantheon has niches in the walls, Saarinen’s walls undulate to make the space seem larger than it is and to form modern, more secular niches. The space flows gracefully around these and seems to pick up speed. It swirls around like a vortex. Does the air turn into sound waves? That horizontal movement excites the vertical movement above the altar. another Pantheon-like Great Dome at MIT. She’s right. Send your address to TheNewModernist.com and I’ll send you a Hello Beautiful! baseball cap poifect for Spring. The tiny chapel is monumental. A mini-maxi Roman Pantheon. But while the space inside the Pantheon basically carries you up and out the opening on top to ride with the g-ds; in this chapel, the conception of space is more modern. The movement of space on the inside connects heaven to earth. The light above connects to the altar on the earth, by way of the reflections off of Harry Bertoia’s screen sculpture. 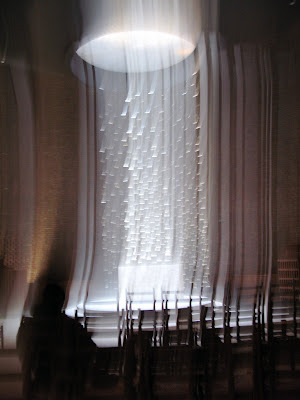 Saarinen’s chapel and the Bertoia’s light-reflecting screen are old friends of mine. And I thought of it when I saw Behnisch, Behnisch and Partner’s Genzyme building, not far away, also in Cambridge, Mass; an office building highly “sustainable.” They use a similar sculpture, this one to reflect light down into the offices. Sustainability does contain a spiritual aspect. You are currently browsing the archives for the MIT category.